Over the years I've come to like Oprah Winfrey, and admire her, even though I wouldn't describe myself as a fan. At a certain stage in her talk-show host career she decided to take the high road away from the Jerry Springer-style gutter stories, not wanting to humiliate any human being. My appreciation is tempered by the almost nauseating give-away shows along the way, orgies of American consumerism. And the tenor of some of her spiritual statements can seem over the top. Oprah is a good person though, and she has become a fine orator with an impressive congregation, including much of Hollywood if the Golden Globe crowd shots are to be trusted. I figure Oprah should stick with being an inspirational figure who stirs her audiences with messages of empowerment. She shouldn't be president of the United States, as so many are now gushing. 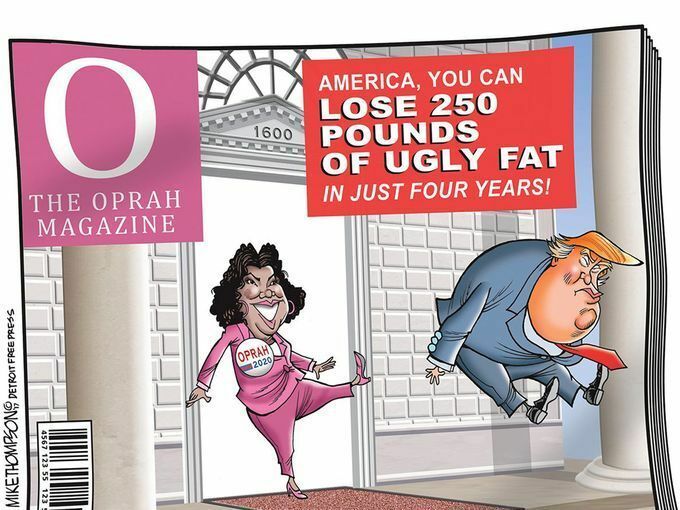 Oprah in 2020! Sure, another billionaire television star who built his own brand is president at the moment, but look how that is working out. But Oprah is good and Donald is bad, you might say. Ya, but it's not just about Trump's belligerence and egotism. He is not qualified in any way to lead a nation the size of Tonga, let alone the United States. He doesn't understand the constitution, he figures the office makes him a dictator, and...well, you know. So Oprah would be different, you argue. She certainly would be better, yet she has not a shred of political experience, nor been a legislator at any level of government. She too would be a populist president, just a more likeable and eloquent one with loftier ideals. Remember as well that she would be 67 years old at the time she took office. I remember the days of yore when a young pup named Barack Obama was questioned as a suitable candidate for president because of his supposed inexperience. Read his resume as a civic organizer and then a senator and you'll realize that he paid his dues not just in learning the ropes of government but in sponsoring substantive legislation which made a difference in the lives of everyday people. He was a politician in the best sense, both in terms of sweat equity and inspiration. I pray -- literally-- that Oprah will stick with being an influential motivational icon and that people of integrity on both sides of the House will emerge to lead the United States. The whole world needs this. I am n total agreement with you. I think Elizabeth Warren might be a possibility, though. I agree...but I really wanted to give a big thumbs up and an LOL to your cartoon!